If the chip+MCU production can transport the data via series port but can not transport the data via USB mode. This may be caused by enabling the power saving mode. Because the power saving mode will close the USB communication to save the power. 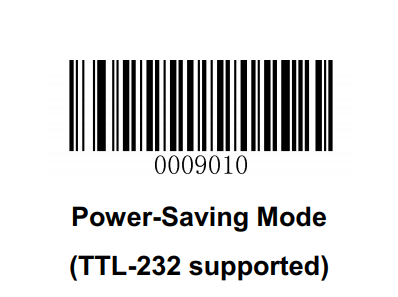 Take EM3296 for example, EM3296 can scan below barcode to enable power saving function, at the same time USB mode will be closed. Sometimes the device transmits wrong data to upper computer or misses some data When it is on KBW mode, especially when the performance of upper computer is not very good. Because if the performance of upper computer is not very good, its speed of receiving data will be slow, at the same time the speed of sending data is fast on our devices, upper computer will be late to receive the data. So we can increase delay between the characters to slow down the speed of sending data. 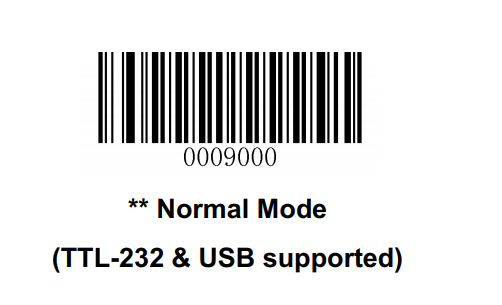 Take HR22 for example,you can scan below barcode to increase the delay. If the customer's barcode is unicode encoded, you should turn on unicode output mode and ALT + keypad, then you can directly output the relevant characters in supported unicode programs (such as MS Word) and not need to select the related code page. 1.If it is not necessary,turn off Alt+KeyPad. 3.Set Polling Rate to 1.